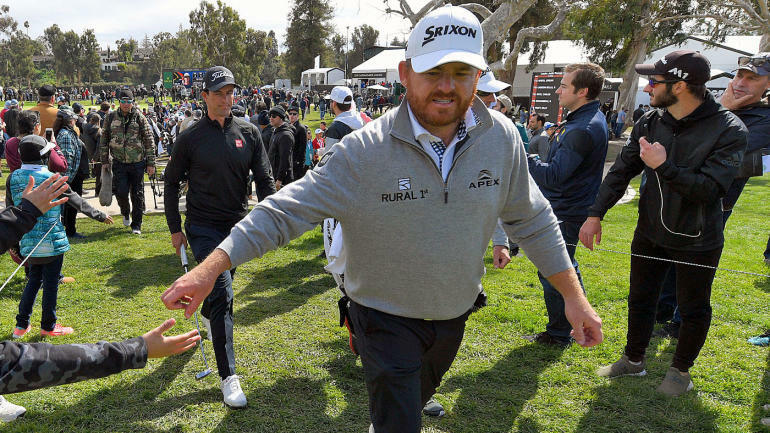 As far as scripts go, it wasn't a Hollywood ending, but J.B. Holmes eventually got the job done at the 2019 Genesis Open with a 1-under 70 in the final round to 14 under and defeat Justin Thomas by a single stroke. Holmes trailed Thomas at four after they both played the final 16 holes in their third rounds early on Sunday morning, but Thomas shot at 75 in Round 4, which was played in the afternoon. The whole thing sounds straightforward, but it certainly was not. 0 and Holmes made birdie. They flipped on no. 11 as Holmes three-putted from 3 feet away and Thomas made birdie to take it back from him. Then Thomas four-putted (!) The 13th and three-putted (!) The 14th to give the lead back again, and he never regained it as Holmes parried his way home to the victory at the Riviera and his fifth PGA Tour title. 19659002] "We wanted to put on a good show for everybody so me and Justin thought we would be three-putt to some short distances," Holmes told Peter Kostis or CBS Sports. "It was really tough on the back side. The wind was blowing hard. It was hard putting. It's the way you want to win. You want to come down to the end and be able to hit shots and make some key puts. had to be exciting to watch. " Here are the rest of our grades for the 2019 Genesis Open. Rory McIlroy (T4): It shouldn't be super surprising that a place like Riviera produced a leaderboard with names like Thomas, Scott, Leishman , and of course, McIlroy. The Ulsterman was awesome from tee to green (second in the field) and actually putted it quite well (top 25). A 5-5 finish on the last two holes on Sunday when he was within striking distance was disappointing, but McIlroy said the back nine in the teeth of the wind was incredibly difficult, and it was always going to be a long shot considering he started eight back of the lead in Round 4. Tiger Woods (T15): Woods faded with a 38 on his back nine on Sunday after lighting up the world with five straight threes to start his third round. He clearly ran out of gas, but he still moved up the leaderboard late in the day as everyone wanted coming home in the wind and the cold. The conditions for that 43-year-old body, though, were not the best. "I got tired. I don't know if I was the only one, but I definitely felt it today," Woods told CBS Sports' Dottie Pepper. "Energy dropped a little bit. Wind, cold, it was a war of attrition out there." Jordan Spieth (T51): The three-time major champ doesn't seem to find the type of consistency that markets the first part of his career. For example, Spieth shot 34 on the back nine of his third round on Sunday morning and opened Round 4 with a birdie at the first. His next hole hit a dead shank into an unplayable area and a double-bogey six, and he went on to shoot 81 (!). And he had to get his last eight holes to do it! The next worst in the field on Sunday was a 78. Spieth put on 3-4-5-6-7-8 on the card in Sunday's final round, with the eight coming on the par-4 10th hole where He took seven of those strokes from 27 yards away. The entire sequence of events was astonishing. CBS Sports was with you the entire way updating this story with the latest scores, analysis and highlights from the Genesis Open, particularly while Woods was on the course.